Famous people born on AUGUST 30 may need to relax more. These Virgo worry too much sometimes and this makes them depressed. Sure, they could take drugs to make them feel better but they want something more natural than what the doctor will order. They should try yoga or aromatherapy. It works wonders on mood transformations. Choosing friends becomes more difficult for famous August 30 celebrities as they grow. However, they are attracted to those who have more than them. They look for people who can teach them things about life and who are beneficial. They have a sincere desire to be of help to others and this is one reason why they would make an excellent therapist or social worker. However, famous people born on August 30 don’t take kindly to cutting corners. As a lover, they want someone who is perfectly compatible. This person should be most like them. Nonetheless, they are guilty of have difficulties with trust. They tend to not give this freely as most people do. Sometimes, this can be most annoying. 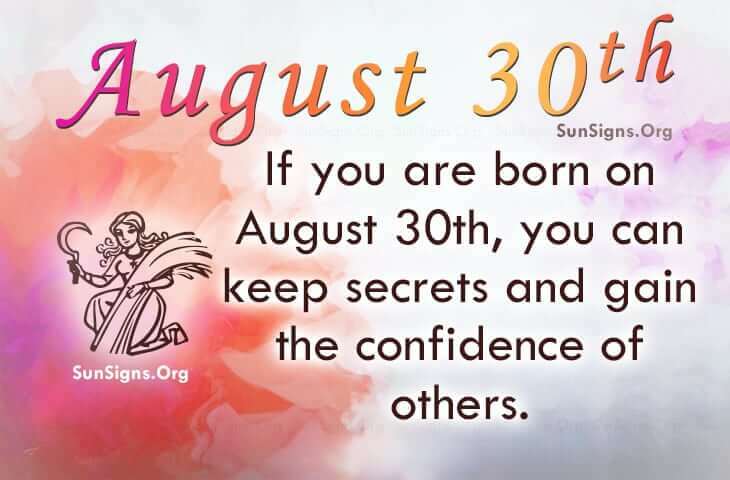 If you are a famous person born on August 30th, you are the Virgo who keeps things to yourself. This is a good quality as you can keep secrets and confidences of others. However, they are likely misunderstood. They pay attention to those little things and can be ambitious and determined people. Some famous August 30 birthdays are listed below.